Aerospace refers to the branch of technology concerned with the capabilities for air travel or aviation within the Earth’s atmosphere (aeronautics) as well as space flight (astronautics). In some ways, it could be characterized as the human effort to fly, through a combination of science, engineering, and business. Within Canada, the aerospace industry essentially has three principal areas of focus: space systems, defense systems, and civil/commercial interests. It is estimated that roughly 70% of this industry’s activity is devoted to manufacturing, which in turn accounts for about 30% of the total research and development investment in all manufacturing within the country. Due to the nature and/or intended use of such equipment, precision technology is needed to produce each piece to their exact design specifications for optimum performance and safety. Such technology is available to parts designers and/or manufacturers within the aerospace sector through Noble Precision’s 5-axis simultaneous CNC machining capabilities. Utilizing this state-of-the-art equipment, in conjunction with the knowledge and abilities of the Noble Precision team, manufacturers can achieve practical and precise solutions to even the most complex production needs. For some aerospace manufacturers, achieving the precise and practical solutions they need may not be viable internally, or perhaps the technology required could be cost-prohibitive; this in turn limits their ability to compete in their markets and affects overall profitability. 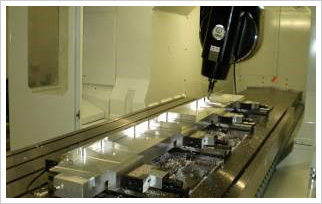 These circumstances provide an ideal opportunity to engage the services of Noble Precision and benefit from their experience/expertise relative to 5-axis simultaneous CNC machining. Visit our Technologies page for further information on the full range of technologies and services offered by Noble Precision for manufactures and suppliers in the aerospace industry. For practical solutions to complex manufacturing needs within the aerospace industry, call the precision manufacturing specialists at Noble Precision at 647-499-7569 or Contact us to schedule a complimentary consultation on how our technologies and services can support your specific requirements.